In this Nov. 28, 2017 photo, Pamela Wang poses for a photo in Kealakekua, Hawaii, with an avocado she found while on a walk. Wang is waiting to hear back from Guinness World Records to find out if the 5-pound (2.3-kilogram) avocado she snagged is the world's largest. 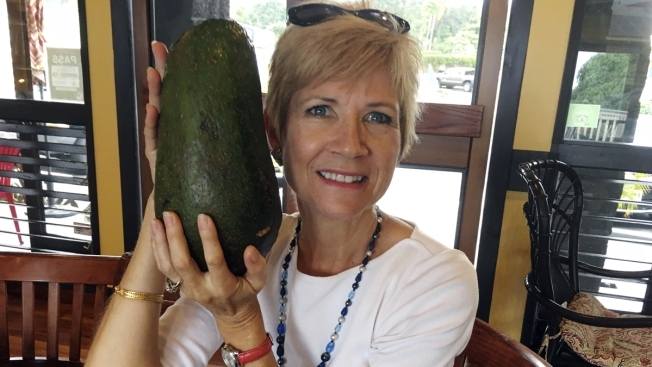 A Hawaii woman is waiting to hear back from Guinness World Records to find out if the massive avocado she snagged is the world's largest. "I see avocados every day, and I pick up avocados every day, but this one ... it was hard to miss," Wang said. "It was as big as my head." She met up with friends and showed them the enormous avocado. Wang's friends began making inquiries online, uncovering information that indicated that the avocado might just be the largest on record. After six months of dieting and two failed attempts, 58 members of the 'Tornadoes', a motorcycle display team of the Indian Army, climbed onto a motorcycle together to break a world record. The Indian Army broke their own previous world record of 56 people on a moving motorcycle, which they set on December 28, 2013, according to the Guinness Book of World Records. Wang submitted an application to Guinness and expects to hear back within two months. She had Ken Love, executive director of Hawaii Tropical Fruit Growers, witness the avocado's weighing. Guinness requires an expert to be present. "I've seen (avocados) longer and I've seen them fatter, but not both," said Love, who verified the fruit's weight at 5.23 pounds. "I think people have other ones that they don't weigh, but I think this one, it was way up there." Elizabeth Montoya, assistant public relations manager of Guinness World Records America Inc., wrote that the company doesn't have a category for the largest avocado. It does, however, have one for the heaviest.